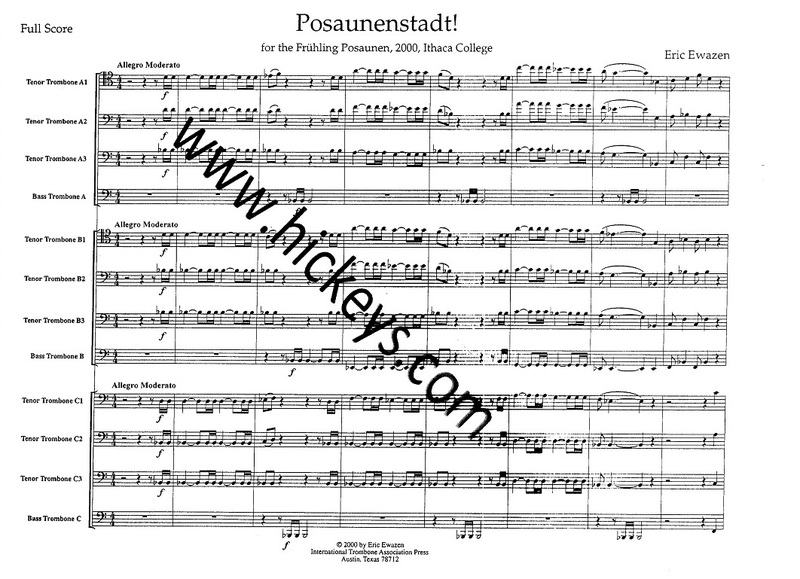 Originally for woodwind quintet and orchestra, here in a piano reduction by the composer. 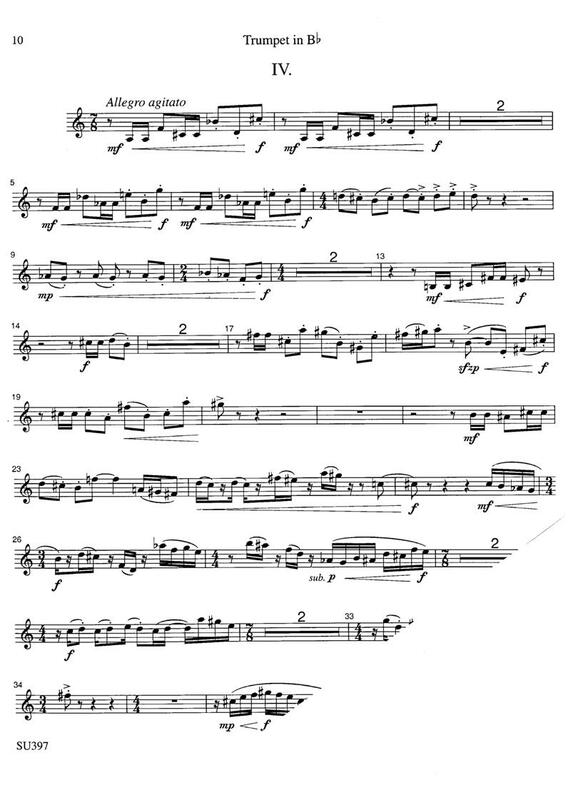 From the Concerto for Euphonium & Wind Ensemble in a piano reduction by the composer. 20th Century (1986). 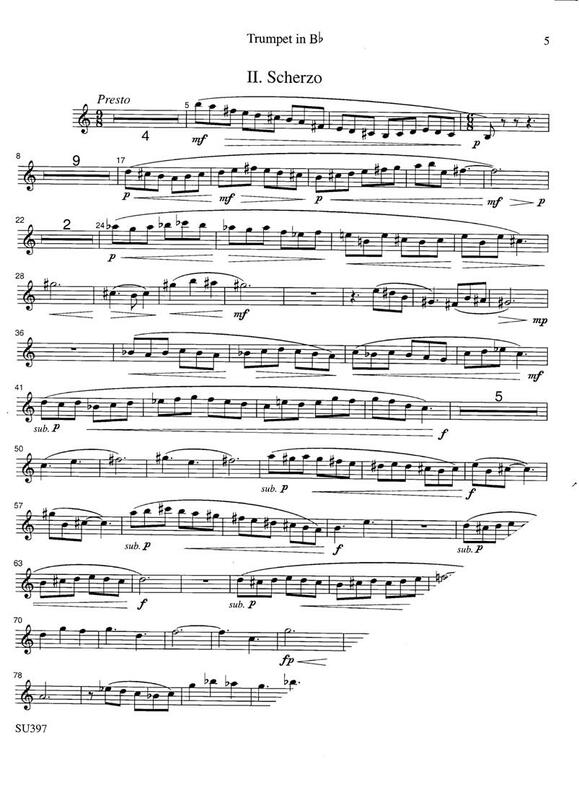 Originally for clarinet, harp & strings, here adapted for bass trombone & piano at the request of Charles Vernon. 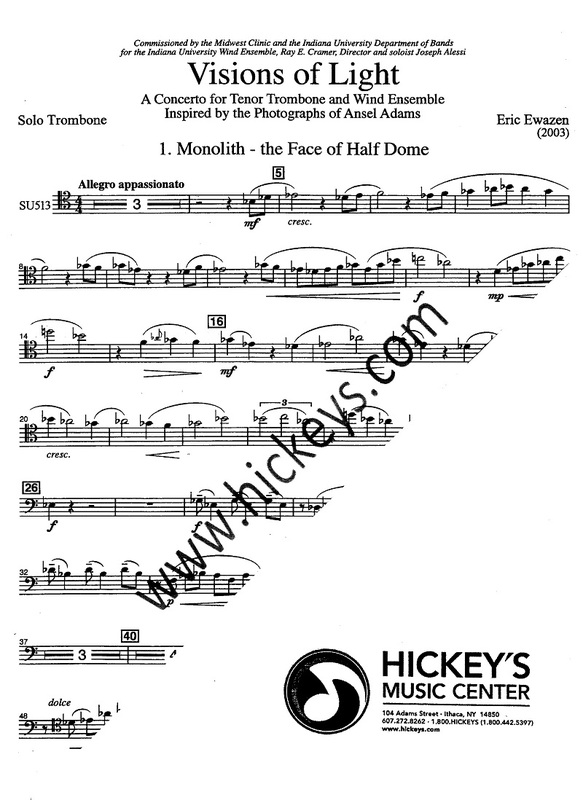 Premiered at the 1997 International Trombone Festival by Mr. Vernon and Eric Ewazen. For bass trombone, tenor trombone or tuba. 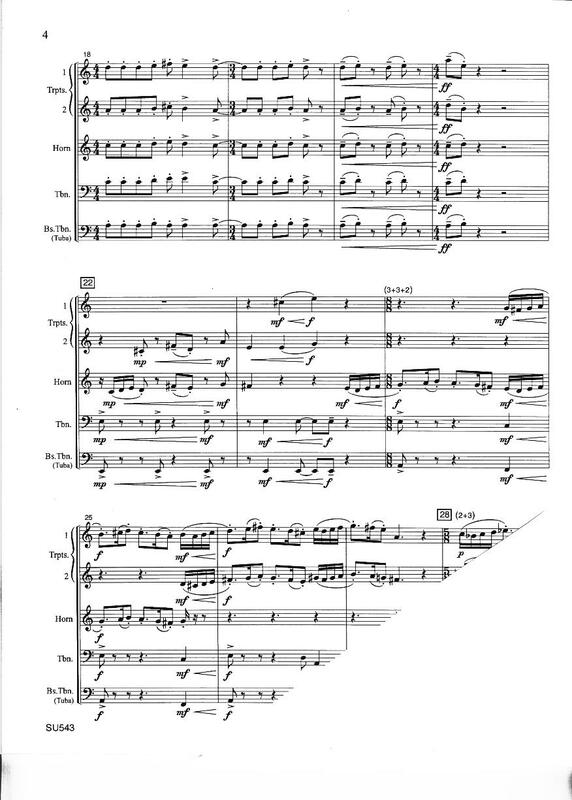 This is the study score for the Ewazen Ballade for Clarinet, Harp and Strings. This is a score only. Parts are available on rental from the publisher. 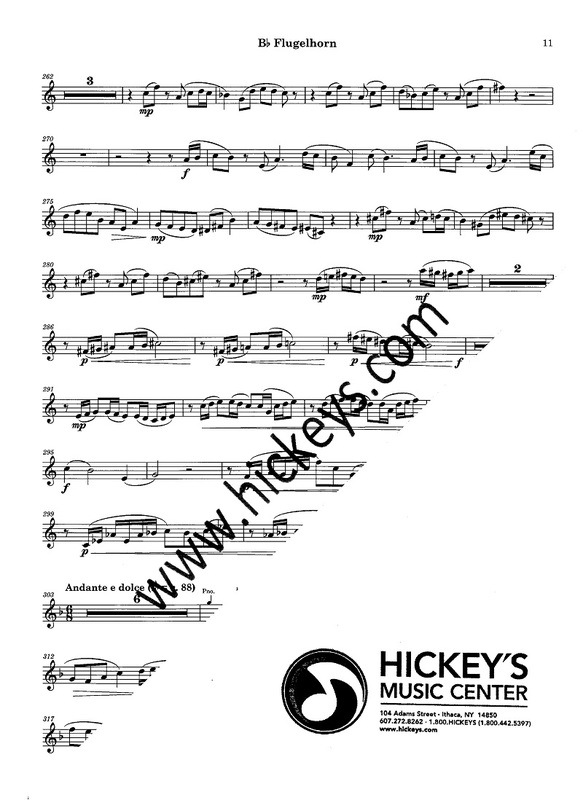 A clarinet and piano reduction is available as our item 046605. 20th Century (1986). 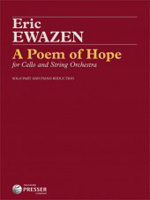 This is the study score for the Ewazen Ballade for Trombone (Bass or Tenor), Harp and Strings. This is a score only. Parts are available on rental from the publisher. 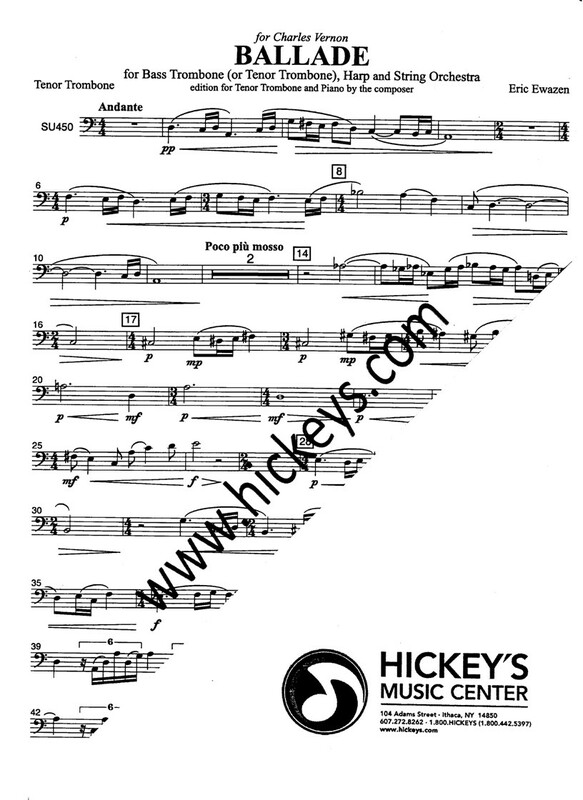 A trombone and piano reduction is available as our item 030371. For TTTB trombone quartet. Ewazen contemplates a natural disaster touching a small town in Italy, and writes of the pathos of loss, an acceptance of tragedy, and a willingness to go on... to survive. Score & parts. 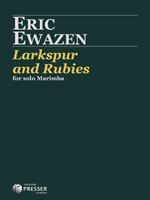 The Ewazen Devil Septet for Tuba Quartet, 2 percussion and piano is from 1976. 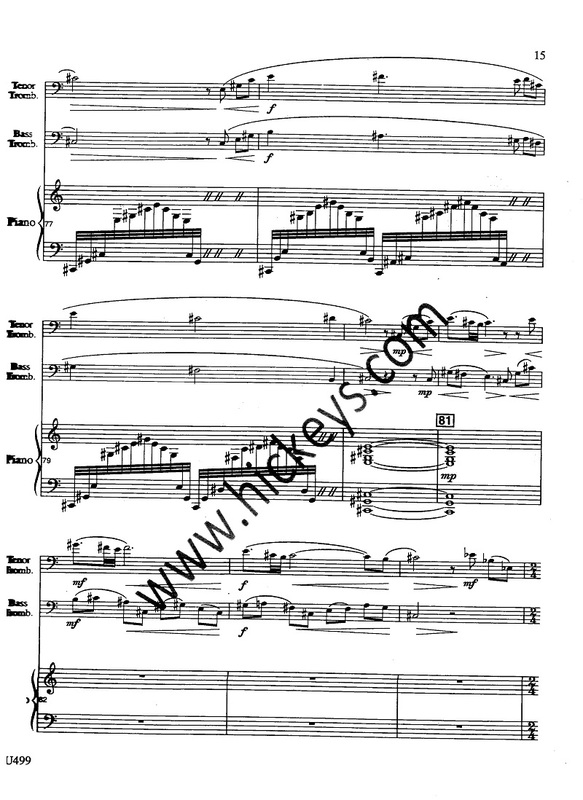 The piano part functions as the score. Movements entitled: of Beauty; of Chaos; of Anguish; of Hope. 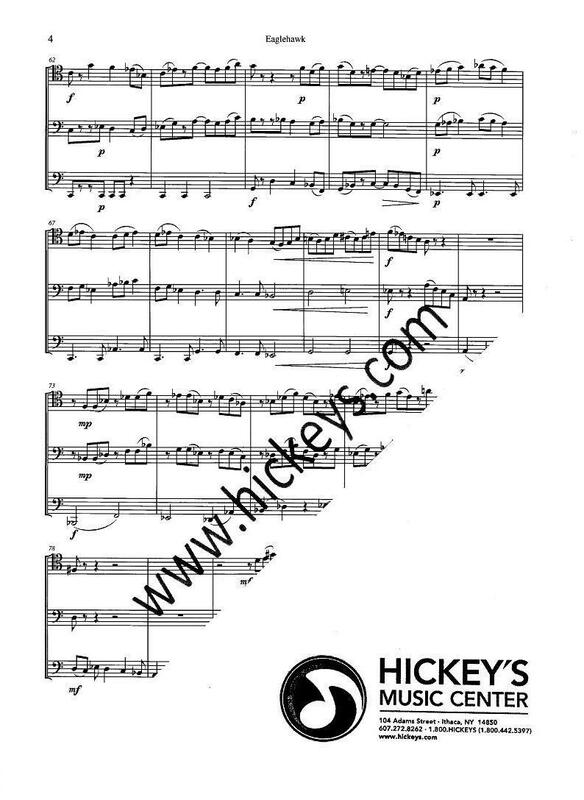 Also available now for tenor-bass duet with trombone sextet (8 players total). See item 095999. Movements entitled: of Beauty; of Chaos; of Anguish; of Hope. Score & parts. 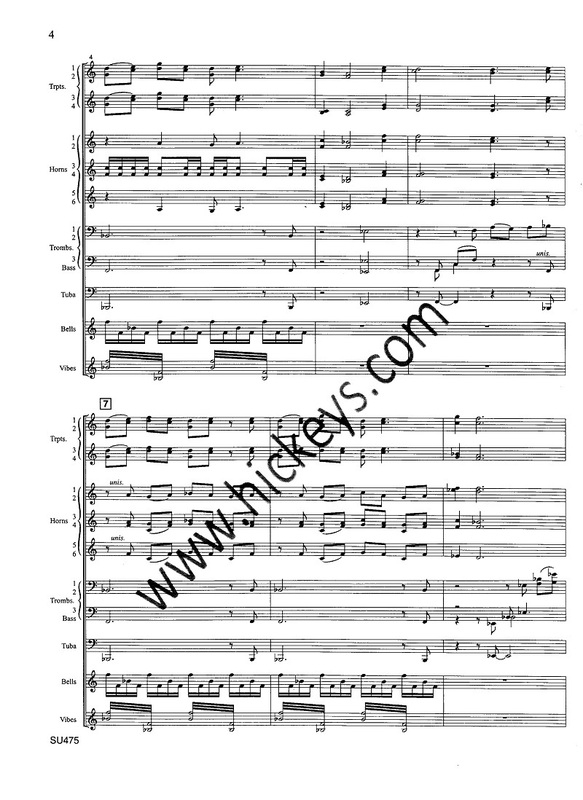 Also available now for tenor-bass duet with piano, see item 105662. 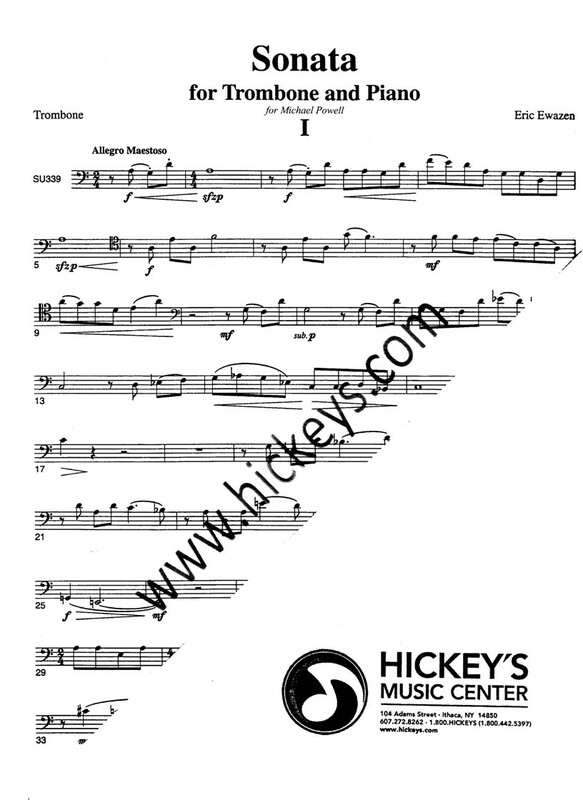 Ewazen's arrangement for trombones of the original for three trumpets and orchestra. 20th Century (1998). Classic early Ewazen. Premiered by the Julliard Trombone Choir under Joe Alessi at the 1998 ITF in Boulder Colorado. For 6 tenors and 2 basses in one choir. Clefs are TTBBBBBB. Duration approximately 4:45 minutes. Score & parts. 20th Century (1998). 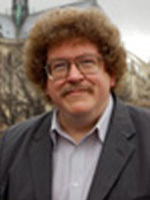 American composer Eric Ewazen. Four movements. A Song from the Heart is a beautiful cantabile song without words, possessing all of Ewazen's expressive elegance, yet is accessible for student-level players as well as on formal recitals. 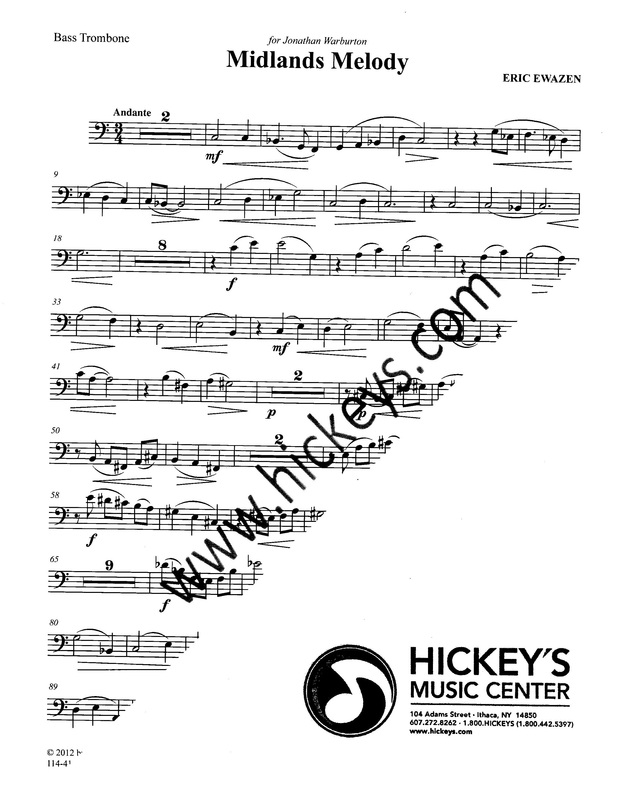 This edition contains a solo part for both C and B-flat trumpets. 21st Century (2011). American composer. 20th Century (1986). 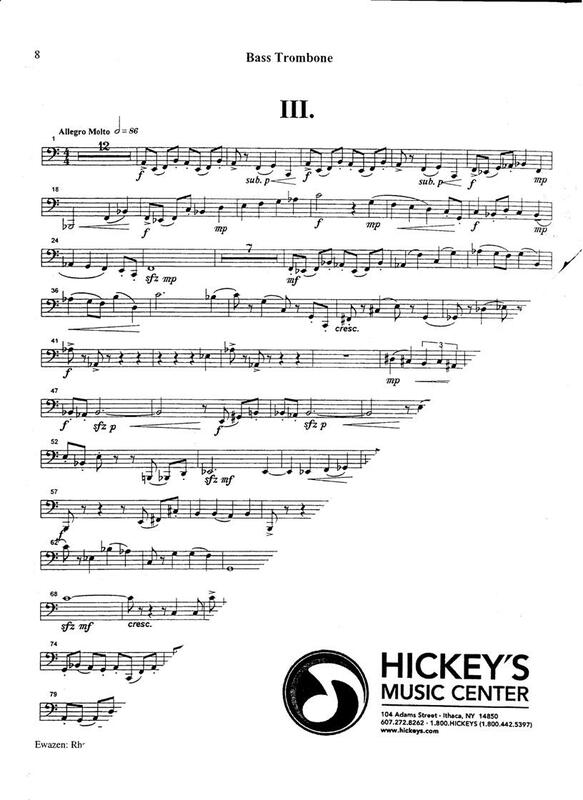 Originally for clarinet, harp & strings, here in a piano reduction. 21st Century (2004). Solo parts in Bb & C included. 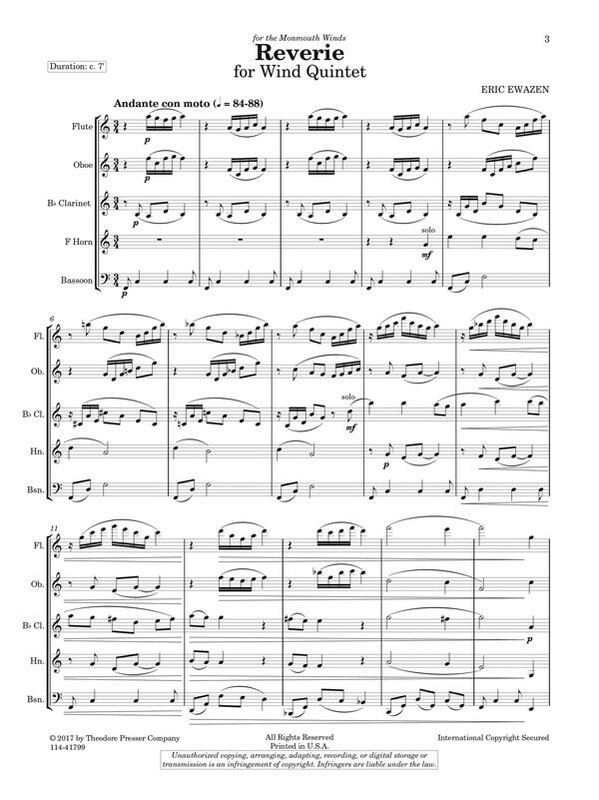 For solo trombone & standard 211.01 brass quintet (6 parts total). 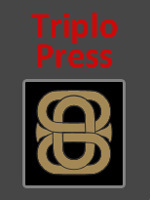 An arrangement of music from Trio for Trombone, Tuba & Piano. 20th Century. 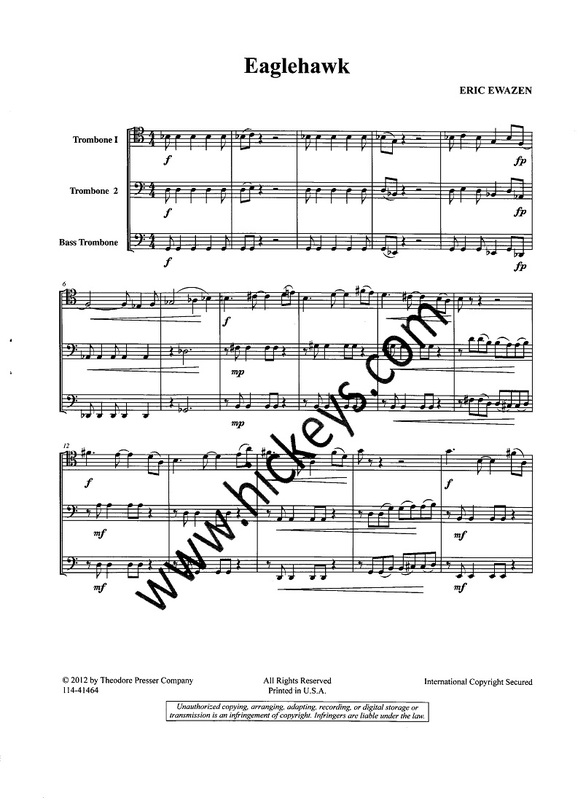 Also available as Bass Trombone Solo w/Trombone Choir (item 047912). 21st Century (2003). 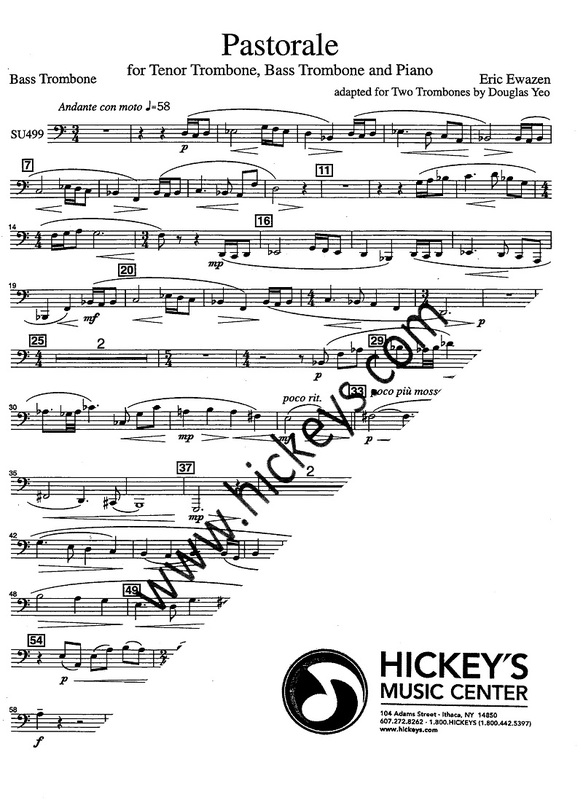 For solo bass trombone and trombone octet (9 parts total). Octet is 6 tenors and 2 basses. Clefs are B-TBBBBBBB. Score & parts. Also available as bass trombone & piano (item 047911). 20th Century. Revised & reissued 2006. Includes score & parts. One of the more popular contemporary brass quintets. 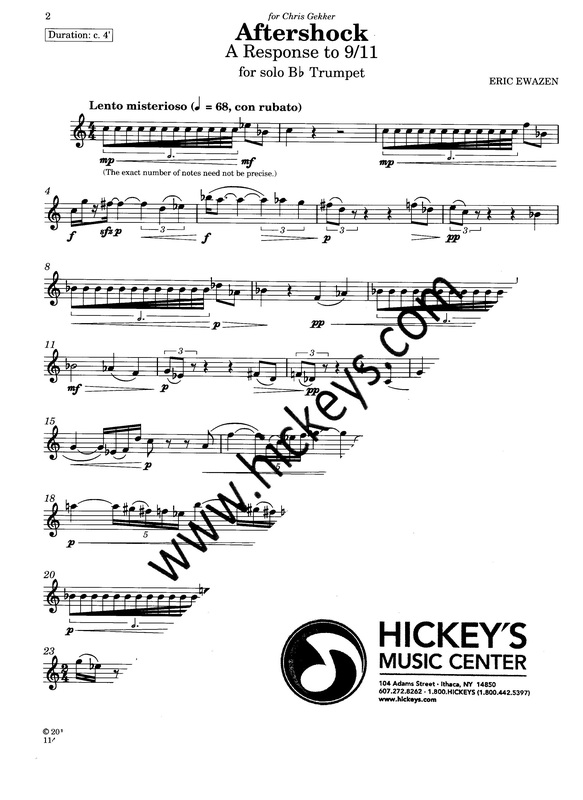 Written for and premiered by the American Brass Quintet in 1989. The bottom part was originally intended for bass trombone, as thgat was the makeup of the ABQ. 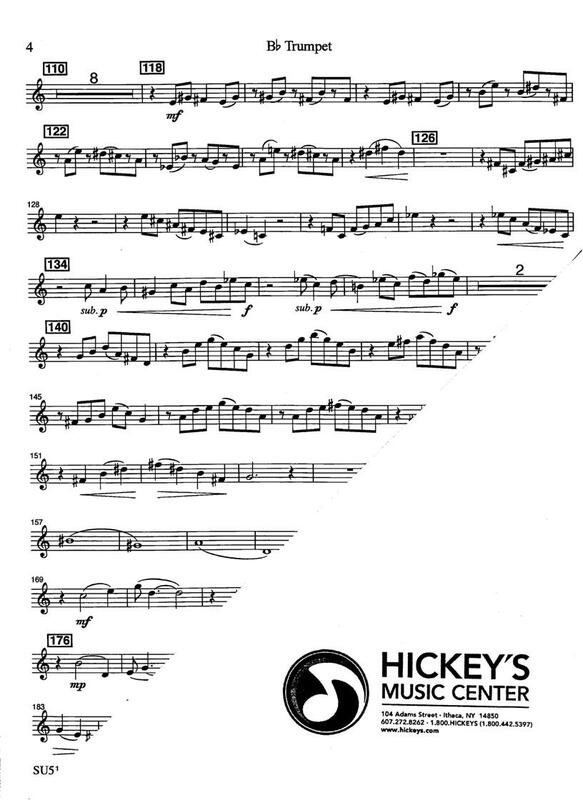 This edition has ossia passages for the use of tuba instead of bass trombone. Movements entitled: The Rose & Crown; The Marquis of Granby; The Dragoon; The Red Lion. Score & parts. 20th Century. Score & parts. 20th Century. 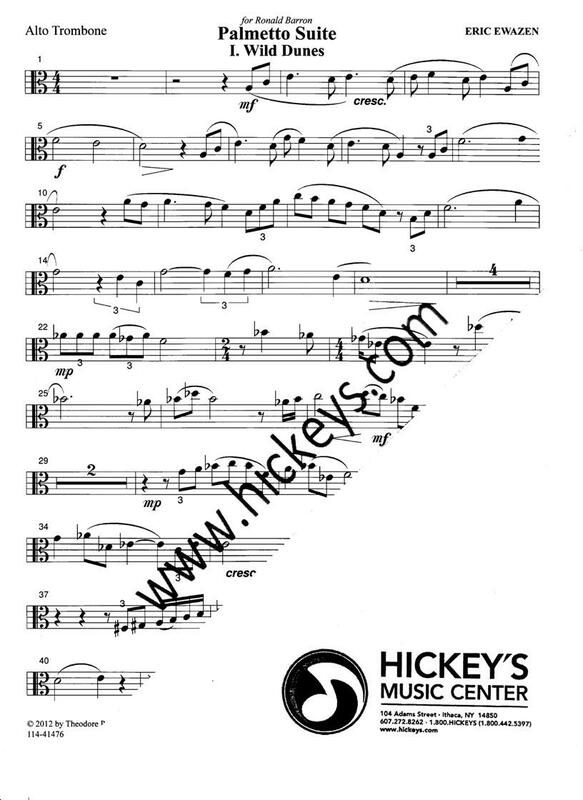 For solo bass trombone and trombone octet (9 parts total). 20th Century (2000). Solo parts in Bb & C included. 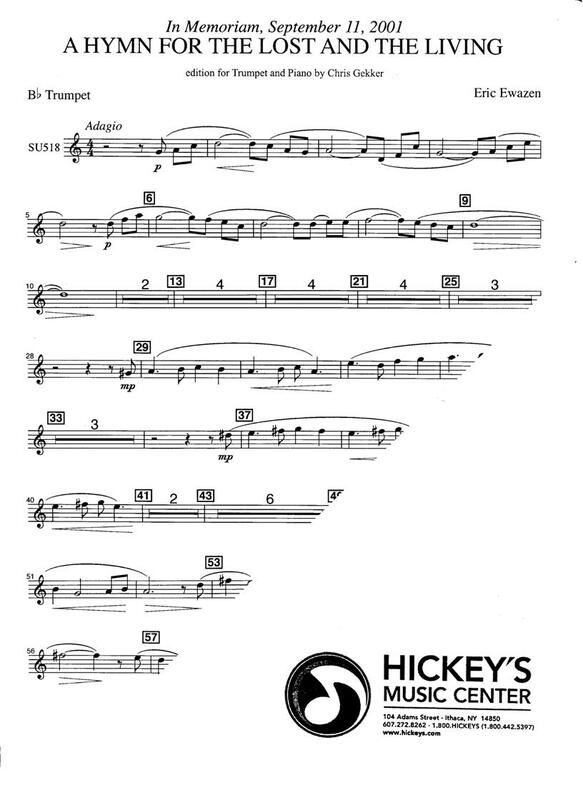 Commissioned by and dedicated to Chris Gekker, who premiered the work at the International Trumpet Guild convention in College Park, Maryland in May of 1991. 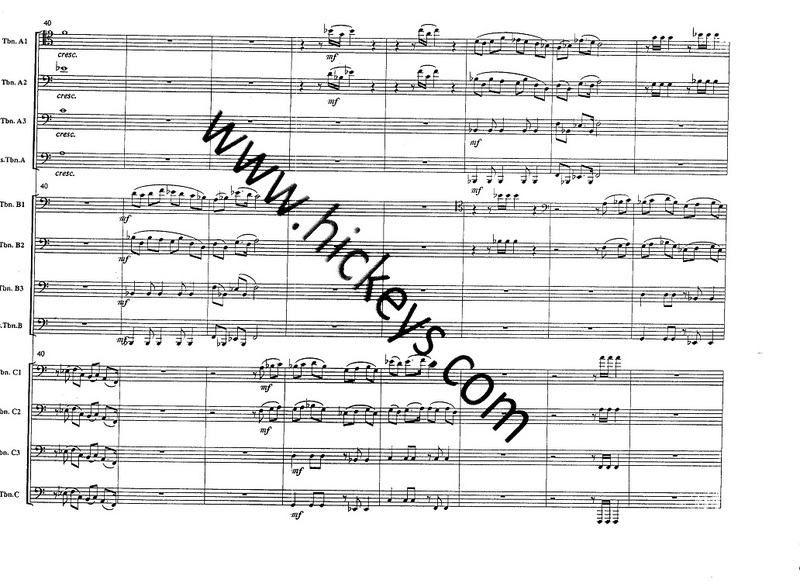 The work was later set with full string orchestra with the title "Concerto No. 2 for Trumpet and Strings" (see our numbers 109572 and 111219). 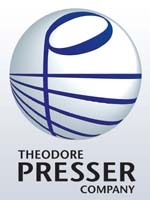 20th Century (1991/2000). 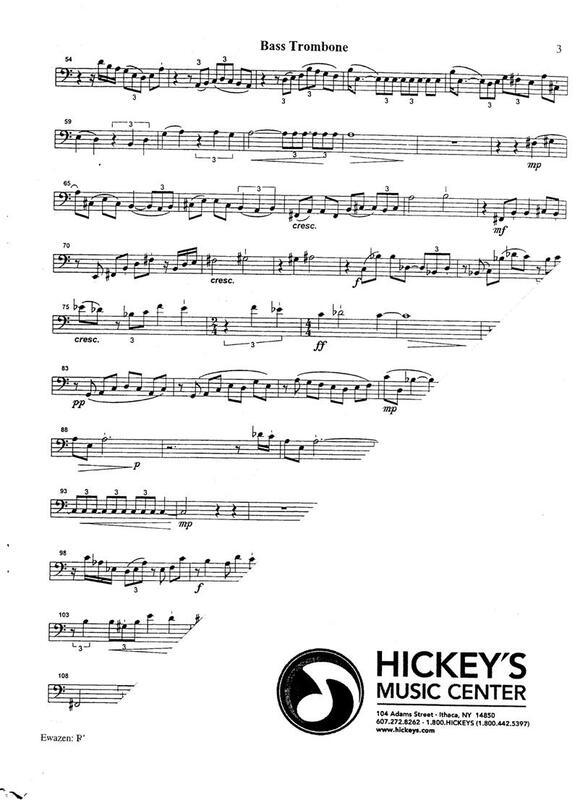 Commissioned by and dedicated to Chris Gekker, who premiered the work at the International Trumpet Guild convention in College Park, Maryland in May of 1991 with piano accompaniment. The work was later set with full string orchestra and given this title, "Concerto No. 2 for Trumpet and Strings." This set contains one each of the string parts only. No trumpet part is included. No score is included. 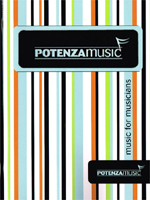 FOr performance with string orchestra, you will need to purchase additional string parts. 20th Century (1996). Full score only. Band parts are available for rental from the publisher. Coordinates with piano reduction edition, our number 029836. Full score only. 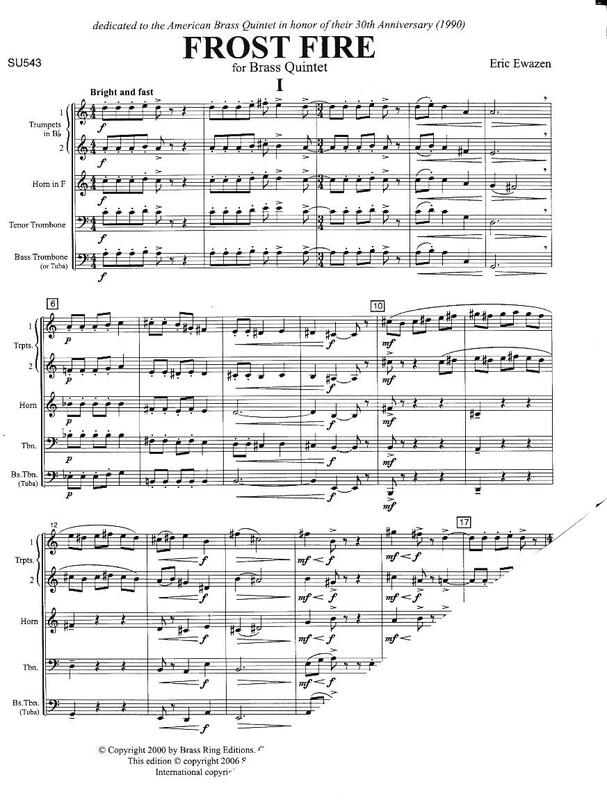 Orchestral parts are available for rental from the publisher. Coordinates with piano reduction edition, our number 029836. For violin, cello & piano with optional drum set. Score & parts. The Duet for a Ceremony was inspired by the poetry of Kahil Gibran. Trumpet in Bb or C.
In Memoriam for William Vacchiano. 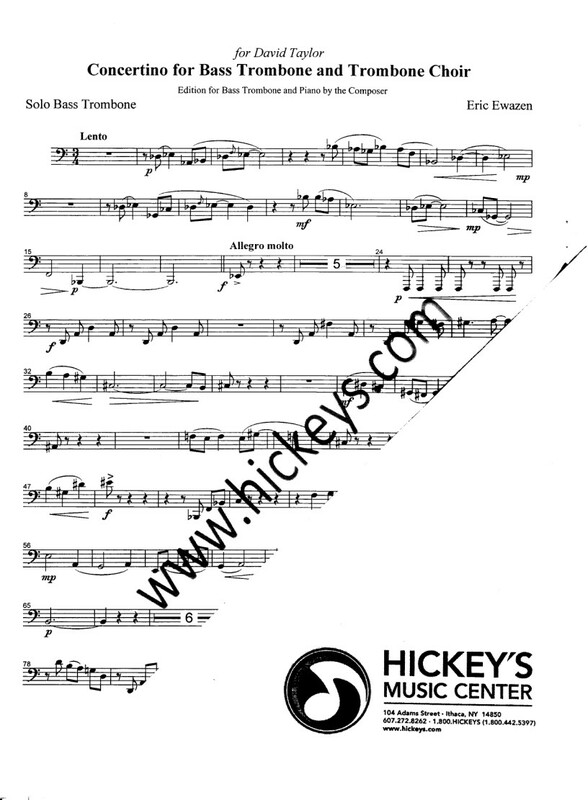 For trumpet & trombone/euphonium (101.00 or 100.10) w/piano. A newly composed work in four movements, each based on an Elizabethan poem. Recorded by Chris Gekker & Milt Stevens on Albany Records. 21st Century (2007). 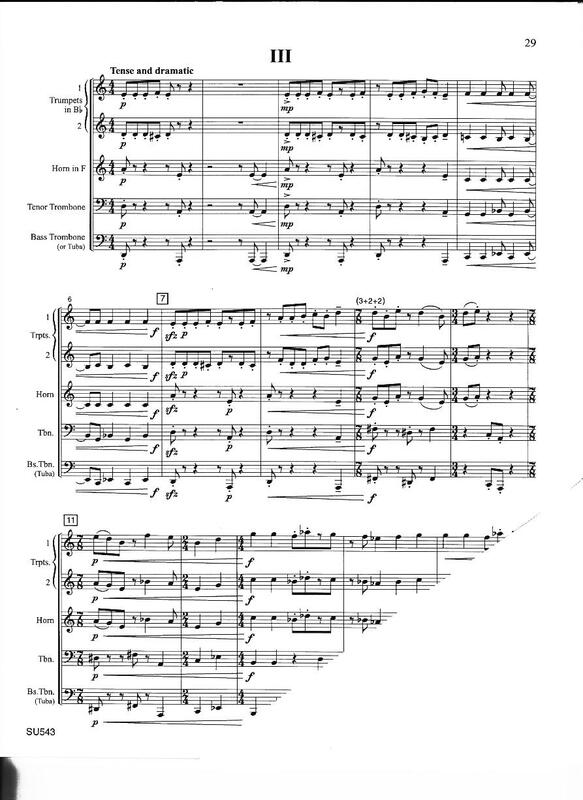 Written for the Metropolitan Trumpet Ensemble. Score and parts. 20th Century. Revised & reissued 2006. Includes score & parts. One of the more popular contemporary brass quintets. 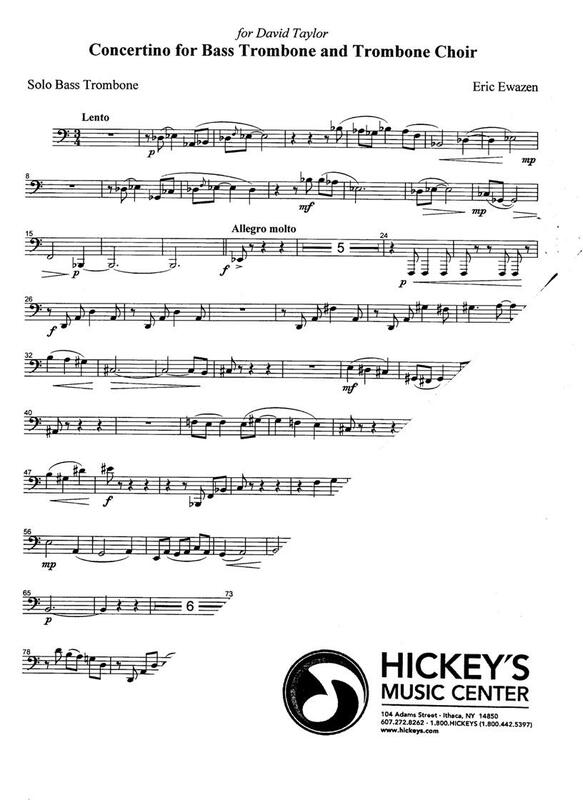 Written for and premiered by the American Brass Quintet in 1989. The bottom part was originally intended for bass trombone, as thgat was the makeup of the ABQ. 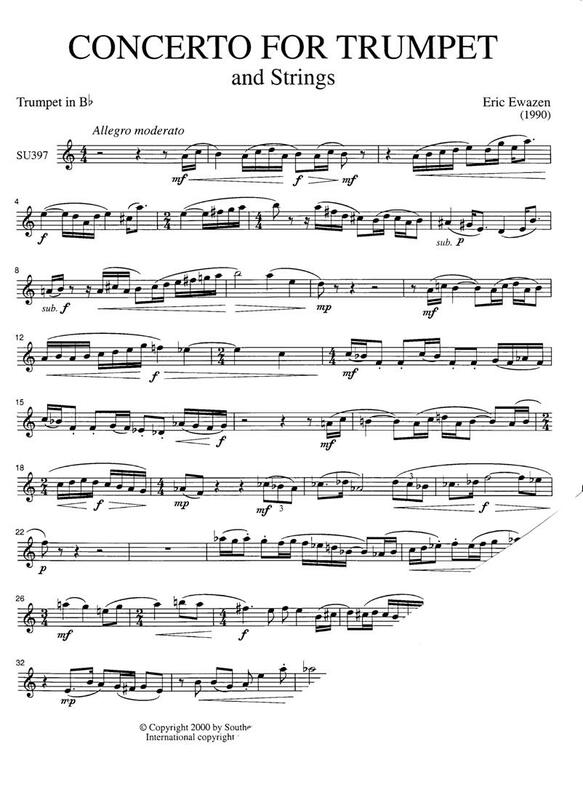 This edition has ossia passages for the use of tuba instead of bass trombone. 21st Century (2001). 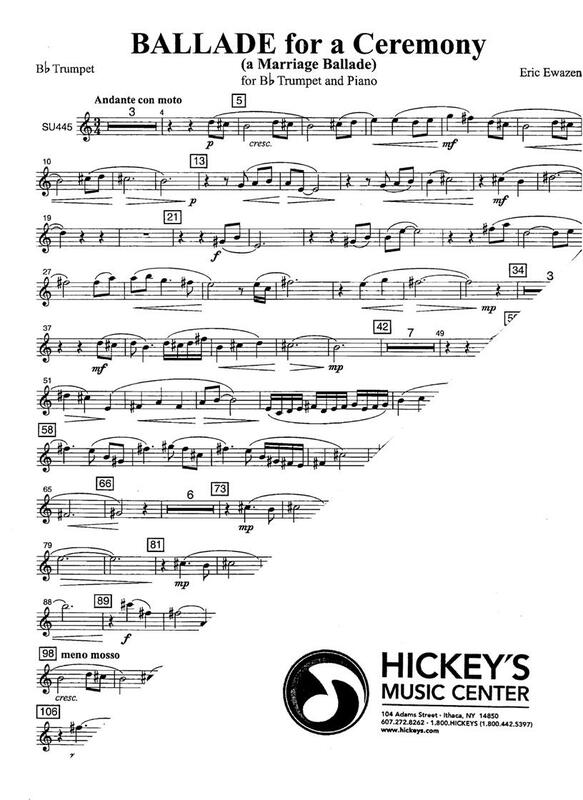 Written for and commissioned by the department of music of Grand Valley State University (Michigan). 21st Century (2005). 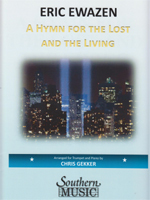 A hymn for the Lost and Living portrays those painful days following September 11th, days of supreme sadness. It is intended to be a memorial for those lost souls, gone from this life, but who are forever treasured in our memories. -the composer. 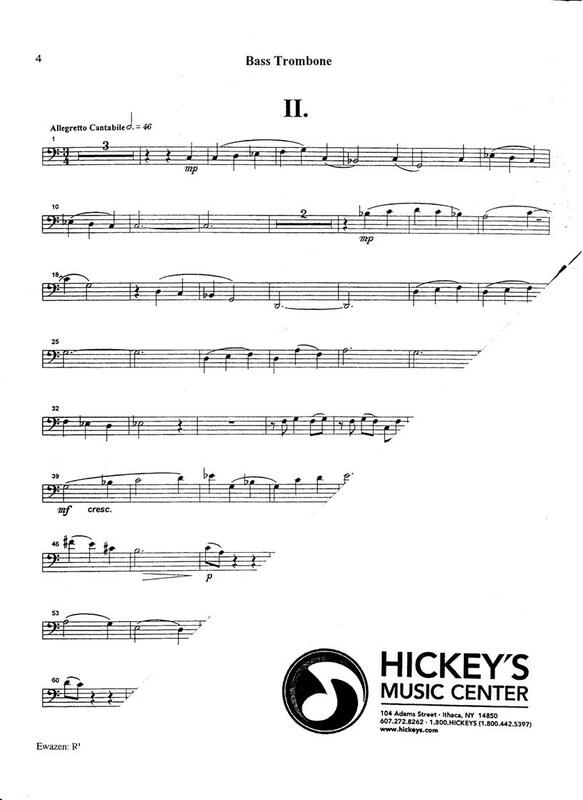 Commission by the International Horn Society for the 2002 IHS Convention held at Western Michigan University. 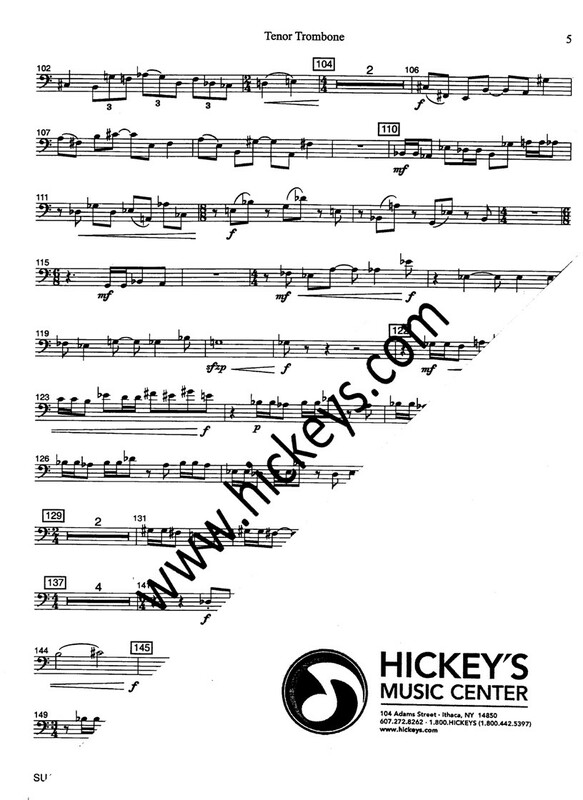 For trumpet in C & marimba. 21st century. American composer. Dedicated to James Olcott. 20th Century. Movements entitled: Wild Dunes; Lowcountry Sweetgrass; The Isle of Palms. 20th Century. 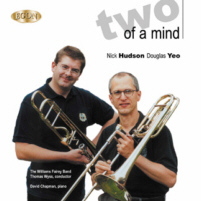 Adapted from the original work for trumpet & trombone duo with piano by Boston Symphony bass trombonist Douglas Yeo. 20th Century. 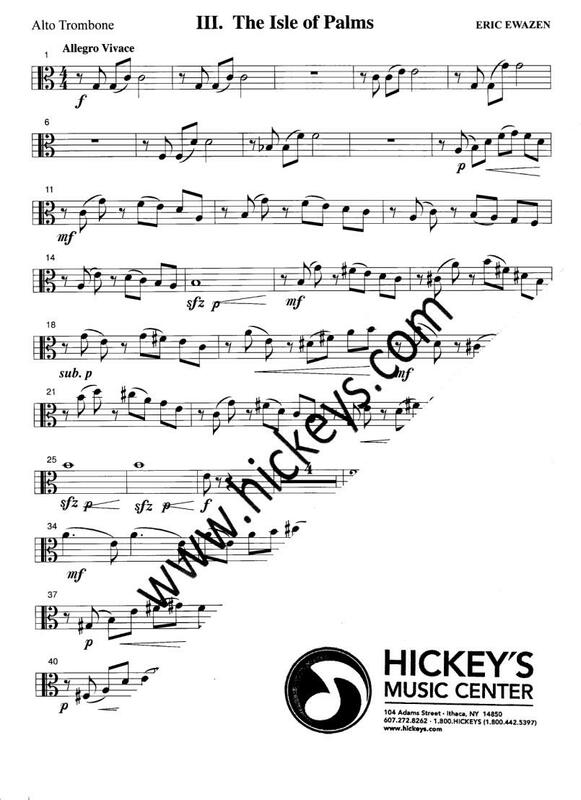 For trumpet, trombone (tenor or bass) & piano. 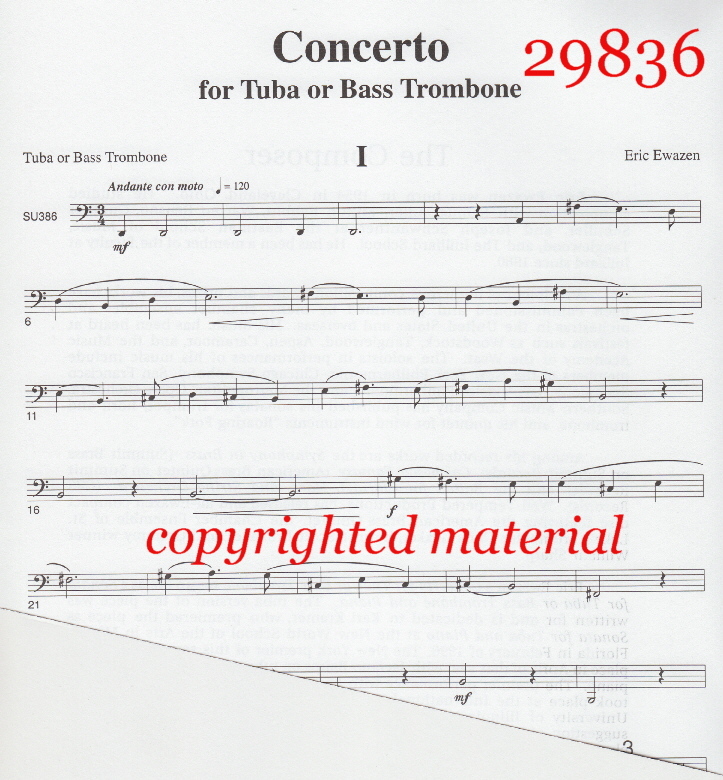 Also available in a version for two trombones, see item 038875. 21st Century (2004). Single movement work in three sections. Commissioned by members of the New York Philharmonic. Score & parts. 20th Century. Solo parts in Bb & C included. 20th Century (1999). In three movements: 1. Andante Misterioso; 2. 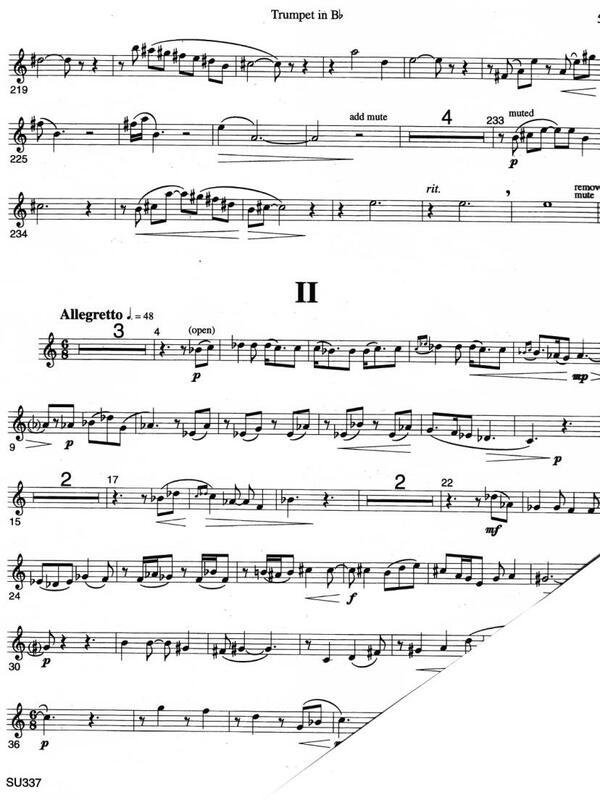 Allegretto Cantabile; 3. Allegro Molto. 20th century (1999). For bass trombone & string orchestra. In three movements: 1. Andante Misterioso; 2. 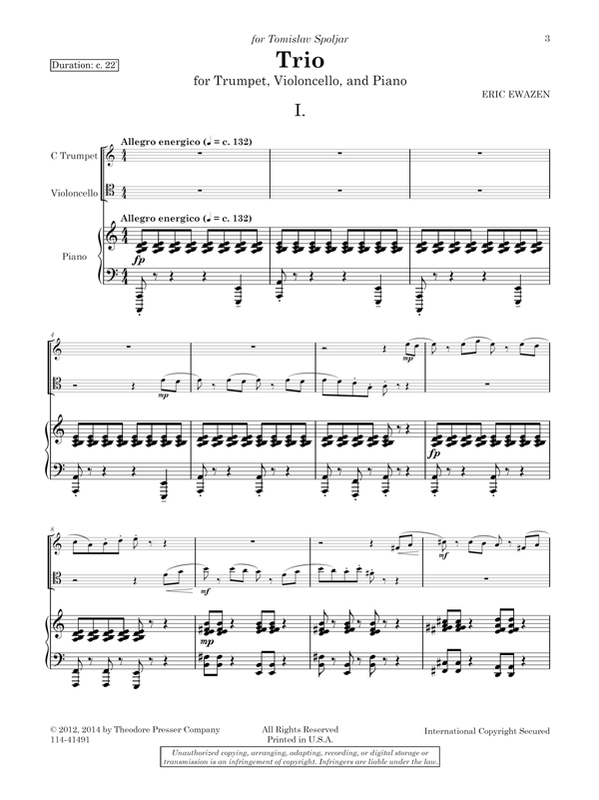 Allegretto Cantabile; 3. Allegro Molto. 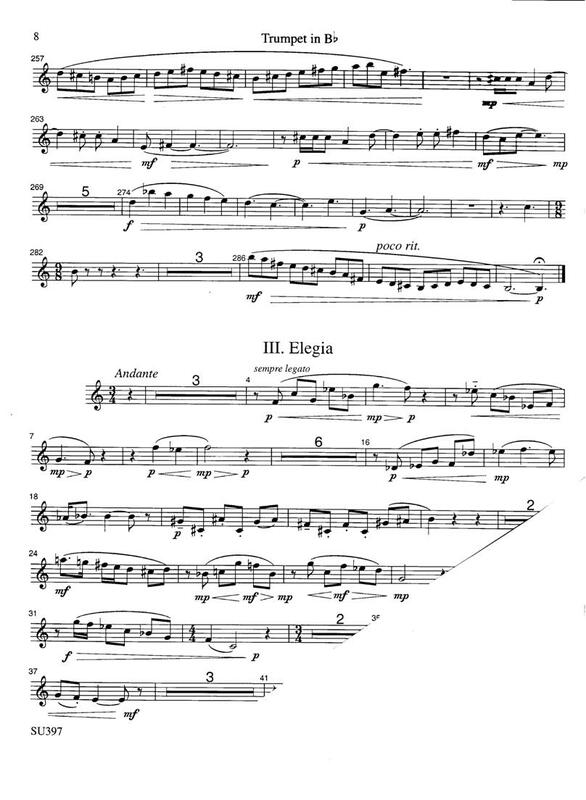 Commissioned for the Borealis Wind Quintet, this work was premiered in 1993. Evocative of the Roaring Fork River in Colorado, its a challenging piece but should prove satisfying. Runs about 20 minutes. For a sound clip, please click here. 21st Century (2001). Programmatic work depcting four photographs by Edward Curtis. The photographs selected are of scenes of Native Americans from the early 1900's. Movements are thus entitled Offering to the Sun (Tewa, 1925); Among the Aspens (Chippewa,1926); The Vanishing Race (Navajo, 1904); and Dancing to Restore an Eclipsed Moon (Kwakiutl, 1914). 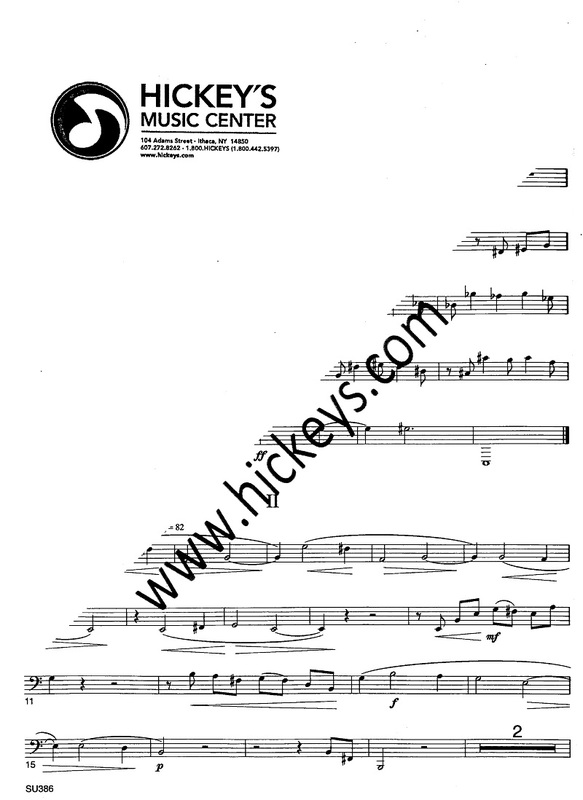 Piano reduction by the composer (originally for quintet and wind ensemble or orchestra). 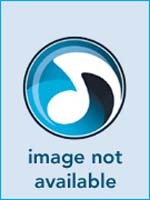 Orchestral or Band parts available on rental. Bottom part is listed for bass trombone or tuba. 20th Century. 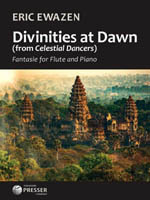 A newer work that has rapidly become a cornerstone in the recital literature. Also known as Concerto No 1. 20th Century (1995). 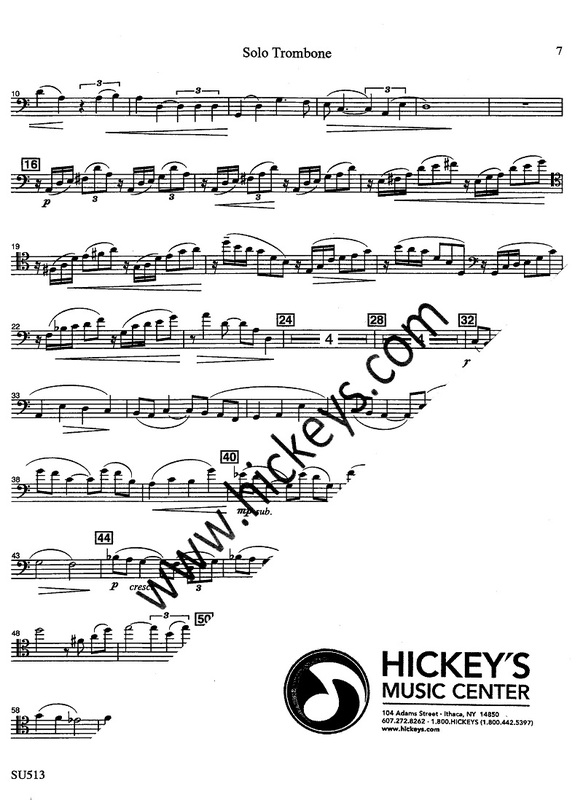 This 3 movement sonata was commissioned by and dedicated to the International Trumpet Guild. 21st Century (2006). Text by Katherine Gekker. For medium low voice, trumpet & piano. 21st Century. 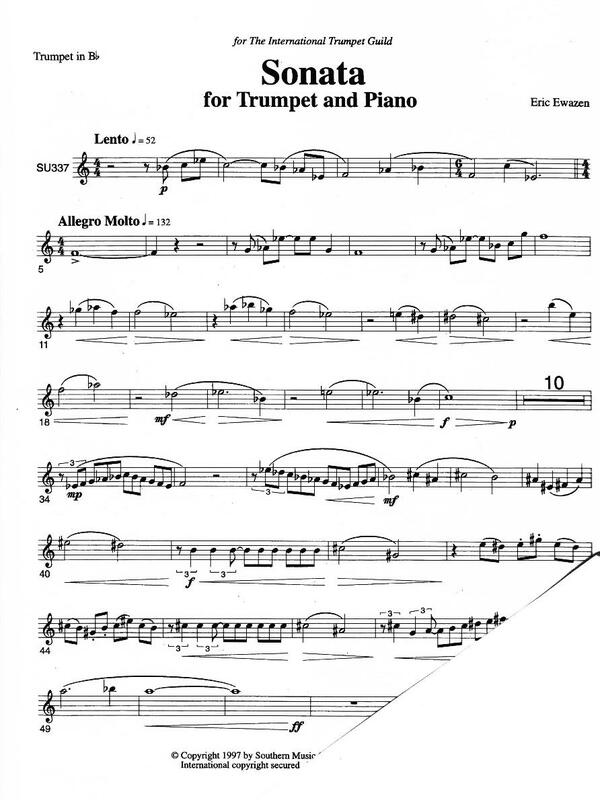 For trumpet in C, cello & piano. 20th Century (1992). 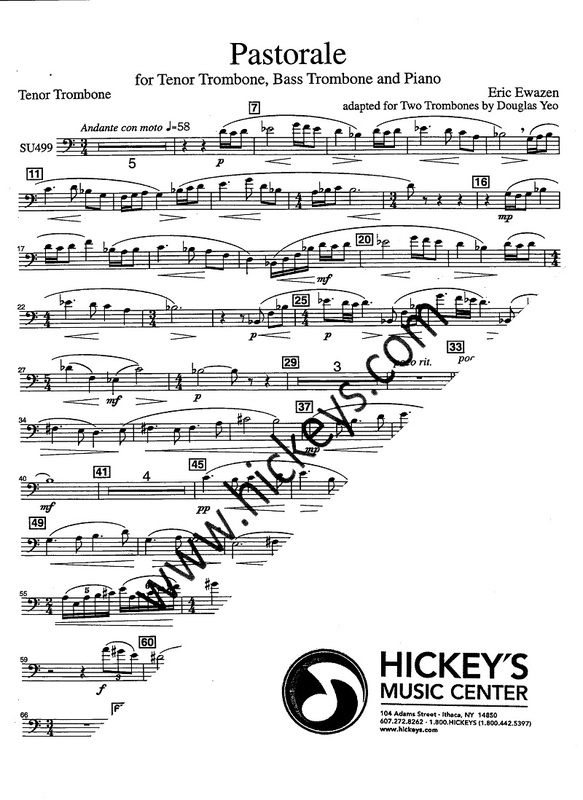 For trumpet (in Bb, C or Eb), violin & piano. Formerly titled "Sonata." 20th Century. Subtitled "A Concerto for Tenor Trombone & Wind Ensemble." Inspired by the photographs of Ansel Adams. 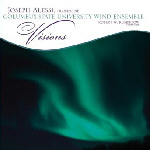 Commissioned by the Indiana University and the Midwest Clinic for Joe Alessi and the IU Wind Ensemble. 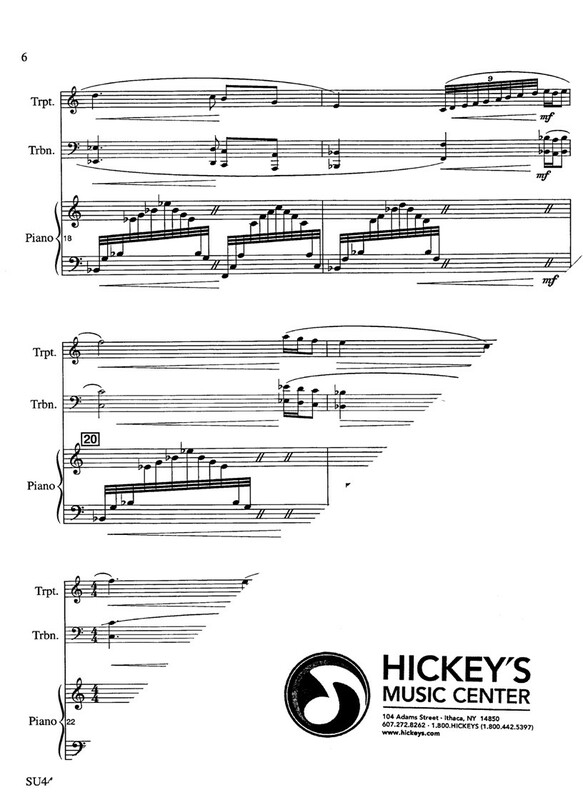 Here available in a piano reduction by the composer. 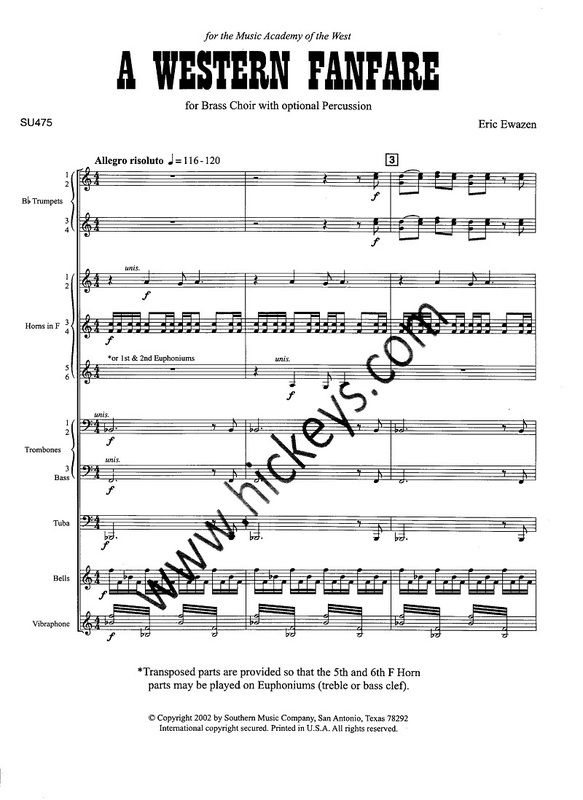 Full band/wind ensemble version is available on rental from the publisher. Movements entitled: Monolith, The Face of Half Dome, Yosemite National Park, 1927; Moonrise, Hernandez, New Mexico, 1941; Thunderclouds, White Mountain Range. 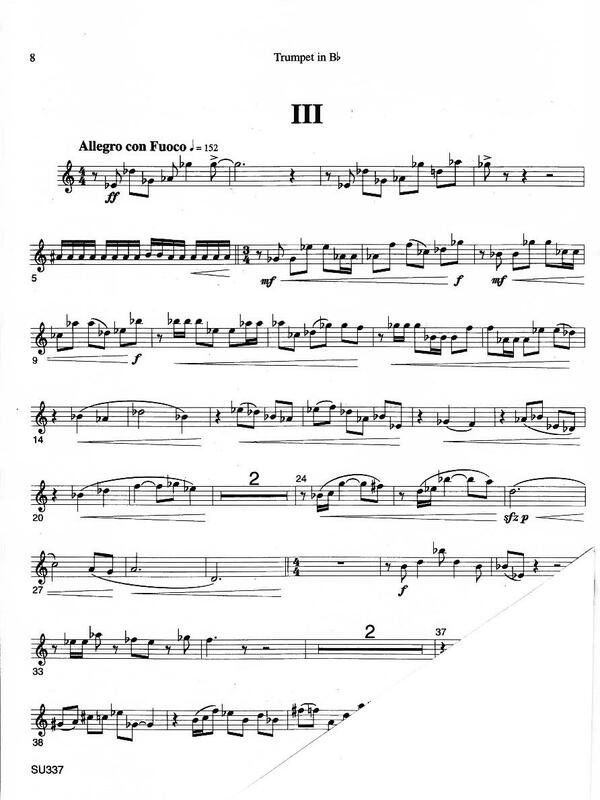 Concerto No 2. 21st Century (2003). Score & parts. 20th Century. American composer. Score & parts. 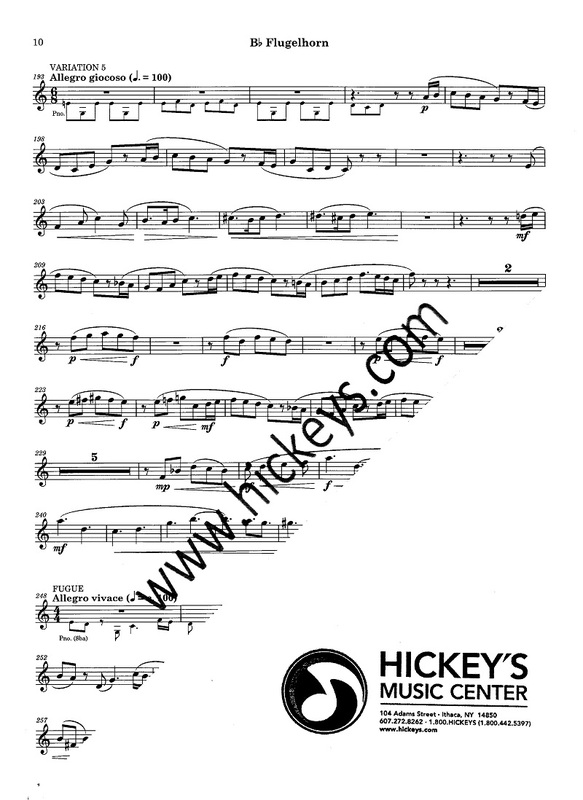 For flute (or piccolo), clarinet & piano. Score & parts. 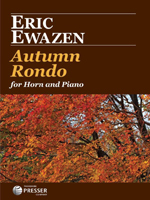 Includes five works by American composer Eric Ewazen: Double Concerto for Trumpet, Trombone & Piano; A Hymn for the Lost & Living; Concerto for Trombone; Ballade for Trombone; Eaglehawk for Trombone Trio. With Eric Ewazen, piano; Niklas Ecklund, trumpet;Yvan Moreau, trombone; Michael Priddy, bass trombone. 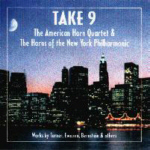 Recorded by four top bass trombonists, Dave Taylor (New York freelance), Charles Vernon (Chicago Symphony Orchestra), Stephan Sanders (Buffalo Philharmonic Orchestra) & John Rojak (NY freelance and American Brass Quintet), this CD is a collection of fivemajor works for bass trombone from the pen of noted New York City composer Eric Ewazen. 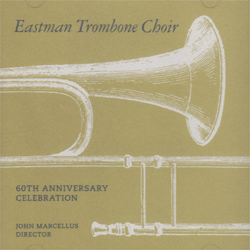 The trombone choir in the first and last tracks is comprised of Joe Alessi, Mark Lawrence, Glen Dodson, Blair Bollinger, Otmar Gaiswinkler, Erik Hainzl, Dietmar Kublbock and Hans Strocker. 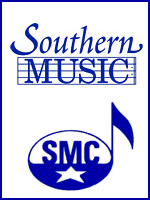 Includes Concertino for Bass Trombone & Trombone Choir (performed by Dave Taylor); Ballade for Bass Trombone, Harp & Strings (Charles Vernon); Concerto for Bass Trombone & Orchestra (Stefan Sanders); Rhapsody for Bass Trombone & Strings (John Rojak); Capriccio for Bass Trombone & Trombone Choir (Dave Taylor). 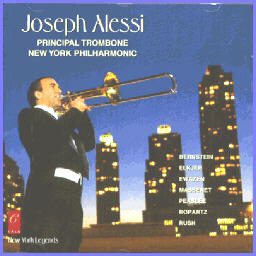 New York Philharmonic principal trombonist and world renowned soloist Joe Alessi presents seven important works for trombone. Includes BERNSTEIN Elegy for Mippy II (music #03127); PEASLEE Arrows of Time (#27740); RUSH Rebellion (#40110); EWAZEN Sonata (#26145); MASSENET Meditation from Thais (#24216); ROPARTZ Concert Piece; BERNSTEIN Waltz for Mippy III (#03128) (performed by Warren Deck, principal tuba with the New York Philharmonic); & Tribute to JJ Johnson (Elkjer). New York Philharmonic pricipal trombonist performs with the Columbus State University Wind Ensemble. Tracks include APPERMONT Colors; THEOFANIDIS I wander the world in a dream of my own making; J.M. DAVID Bright Window; RUMBELOW Refraction; GANDOLFI Vientos y Tangos; EWAZEN Visions of Light. From the toe-tapping rhythm of Tommy Dorsey's Trombonology to the grand landscape of Eric Ewazen's Sonata, this 74 minute presentation of six American works shows a broad cross section of American sound from the 20th century. Accompanied by piano, trombone quartet, and wind ensemble the solo trombone shows a musical palate as diverse as American culture and geography. 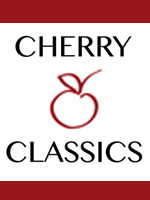 Includes TICHELI Concertino [with Harvard Univ Wind Ensemble]; LaMONTAINE Conversations; CRESTON Fantasy; RITTER-GEORGE Aria and Dance; [with trombone quartet]; EWAZEN Sonata; DORSEY Trombonology. Floyd Cooley (tuba) and Charles Vernon (bass trombone) perform with the DePaul University Wind Ensemble. Includes VAUGHAN WILLIAMS Concerto for Bass Tuba (Floyd Cooley); EWAZEN Concerto for Bass Trombone and Wind Ensemble (Charles Vernon); GREGSON TubaConcerto (Floyd Cooley); STRAUSS Concerto No. 1 for Horn, Op. 11 (Floyd Cooley). 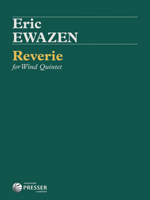 Includes EWAZEN Concerto for Trombone & Wind Ensemble (same as the Sonata, but with added cadenzas); DANNER Slide Ride; PLOG Three Miniatures; PEASLEE Arrows of Time; GUILMANT Morceau Symphonique; NESTICO Reflective Mood. 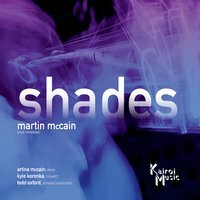 This is the third in a 3-CD set released over the course of several years (the others are "Trombone" - #55421 and "Collective" - #50865). 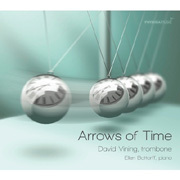 This CD includes works for trombone ensembles, from quartets to larger groups, plus a few featuring soloists. Includes BOURGEOIS Osteoblast (ATTTTTBC octet); PADDING And Trees Would Sing (tenor voice & ATTC trombone quartet); SWEELINCK Mein Junges Leben hat ein End (quartet); VAN ETTEN Panorama (organ & AATTBB sextet); EWAZEN A Duet for Our Time (2 solo bass tbnw/5T 1B sextet); VELDHUIS Jesus is Coming (quartet & boombox); HAGGART/BURKE What's New (6T 1B 1C octet); NIGHTENGALE Turning Back the Clock (solo jazz tbn w/5T 2B septet). • REIJNGOUD Where Do You Want To Go Today? 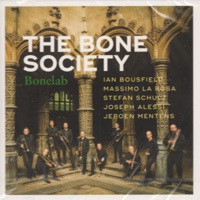 From CD number 2 - "Trombone:"
Artists include Brandt Attema, Mark Boonstra, Remko de Jager, Koen Kaptijn, Ivan Meylemans, Jorgen van Rijen, Nico Schippers, Alexander Verbeck, Pierre Volders. 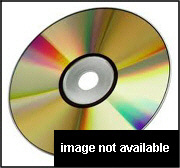 From CD number 3 - "New:"
(Yes, the CDs were released in reverse order of the group's title). A Composer's Insight, Volume 4 is the fourth in a five-volume series on major contemporary composers and their works for wind band. Included in this initial volume are rare, "behind-the-notes" perspectives acquired from personal interviews with each composer. An excellent resource for conductors, composers or enthusiasts interested in acquiring a richer musical understanding of the composers' training, compositional approach, musical influences and interpretative ideas. Features the music of: SamuelAdler, David Bedford, Daniel Bukvich, David Del Tredici, Eric Ewazen, Walter Hartley, Joseph Wilcox Jenkins, Joan Tower, Joseph Turrin, Dan Welcher and Dana Wilson. This book/CD pack contains the same musical and technical challenges found in the original Concert Studies for Trumpet, only on a more advanced level. Lyricism is a large component of this book, with technical challenges of range, tonguing, intervals, and key signatures abounding. 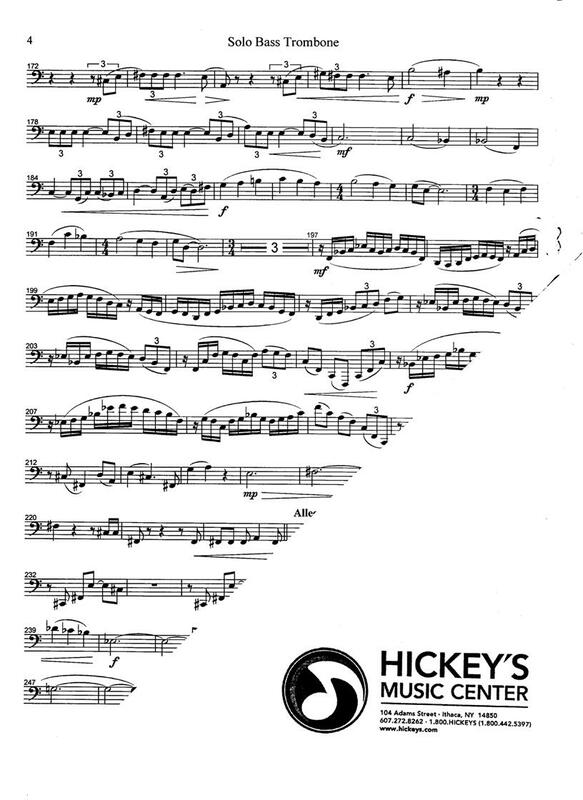 This collection contains music written specifically for Philip Smith, principal trumpet from the New York Philharmonic (we have shown the composer of the book as "Smith" for convenience purposes, though none of the Studies were written by Mr. Smith). Includes: BARNES: Scherzino; BROUGHTON: Chambers; BULLA: Etude Fantasy; COURT: Declaration; CURNOW: Impulse! 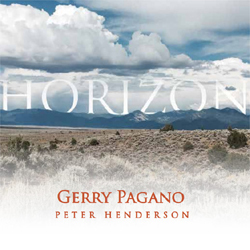 ; Tangents; EWAZEN: Folk Dance; T. JOHNSON: Attitudes; PASCUZZI: Lyric Piece; SAMPSON: Auburn; SNEDECOR: Street Song; Waltz; TURRIN: Coronation Fanfare, for the Millenium of Hungary; Dance Etude; Romance Etude; VIZZUTTI: Crazy Clock; ZING! ; ZWILICH: Spinoff No. 1 & 2. Included is a CD of Philip Smith performing each of these studies. 39 pages. 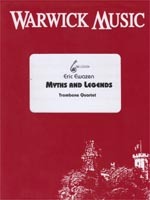 Includes EWAZEN Myths and Legends; BASSETT Quartet; WUORINEN Consort of Four Trombones; TULL Concert Piece (1968); LA MONTAINE Quartet (2002); SCHROEDER For Jim (2005); SNEDECOR Toccata (2005). 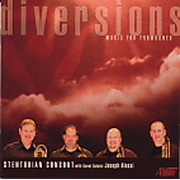 The Stentorian Quartet is comprised of David Begnoche, Barney McCollum, Brent Phillips & Jonathan Whitaker. Chicago Symphony Orchestra bass trombonist Charles (Charlie) Vernon first solo CD. 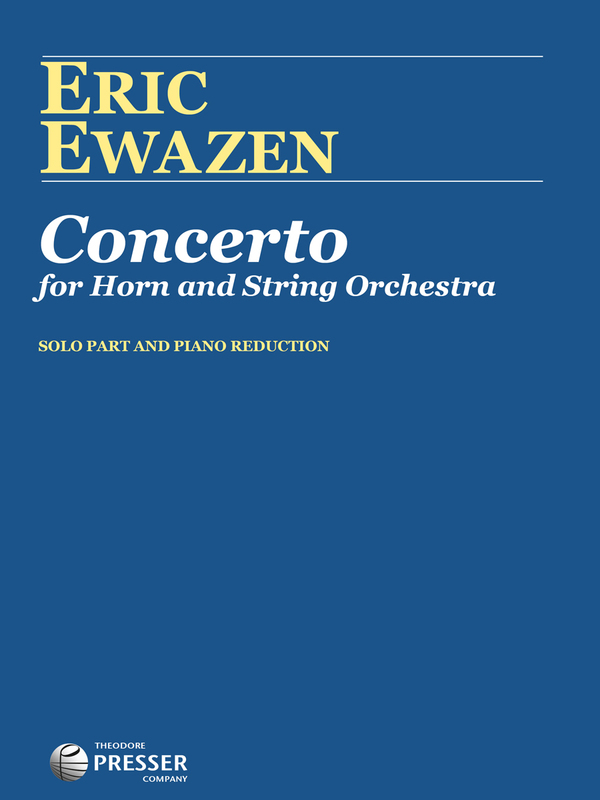 Included are five works from the standard repertoire: HALSEY STEVENS Sonatina for Bass Trombone & Piano (1960); ROBERT SPILLMAN Two Songs; ERIC EWAZEN Concerto for Bass Trombone; ALEC WILDER Sonata; JOHN WILLIAMS Concerto for Bass Trombone [published as "Tuba Concerto"]. With Eric Ewazen, piano. DDD. 73:02. 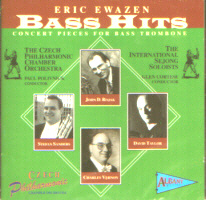 Note: This CD is also known (erroneously) elsewhere as "American Music for Bass Trombone." 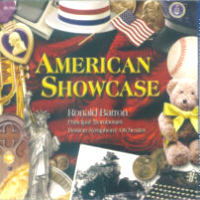 While all the music is certainly by American Composers, the title "American Music..." does not appear anywhere on the CD or jacket. 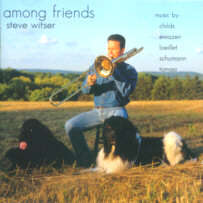 New release by the late Cleveland Orchestra trombonist Steve Witser performing on alto and tenor trombones, assited by Kathryn Brown, piano; Marta Jasberg, cello; and Rip Jackson, harpsichord. 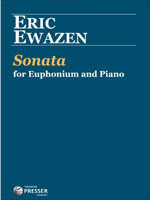 Includes LOEILLET Sonata No 1 in F; EWAZEN Sonata SCHUMANN Three Romances; CHILDS Sonata; TOMASI Concerto. A collaboration bringing together the best of players from today's brass band and orchestral worlds, Nick Hudson and Douglas Yeo. This landmark session by two leading trombone players from different continents and diverse musical disciplines demonstratesan uncanny synergy of styles. Playing together and individually, their unique blend of sound and technique provides a fresh insight in the established trombone repertoire and an introduction to new and original works specially commissioned and premiered on this CD. 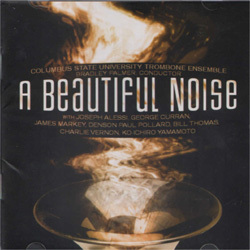 Includes DAVIS Trombone Institute of Technology - (unaccompanied duo for tenor and bass trombone); WATSON Vigilant (DY with Williams Fairey Band); BACH Wir eilen mit schwachen doch emsigen Schritten from Cantata BWV 78 - (NH & DY with David Chapman, piano); LEIDZEN Concertino (NH with Williams Fairey Band); DROVER Mr. Nice Guy: Song for Bass Trombone (DY with Williams Fairey Band); CAMSEY Questions (NH with David Chapman, piano); VAUGHAN-WILLIAMS The Call (DY with David Chapman, piano); Silent Noon (NH with David Chapman, piano); WATSON Fire Divine (NH and DY with Williams Fairey Band); LEBEDEV Concerto No. 1 (DY with David Chapman, piano) (music # 31047); EWAZEN Pastorale (NH and DY with David Chapman, piano) (music # 36348); My Funny Valentine (Drover) (NH with Williams Fairey Band); WOLFE Currents (NH & DY with Williams Fairey Band). 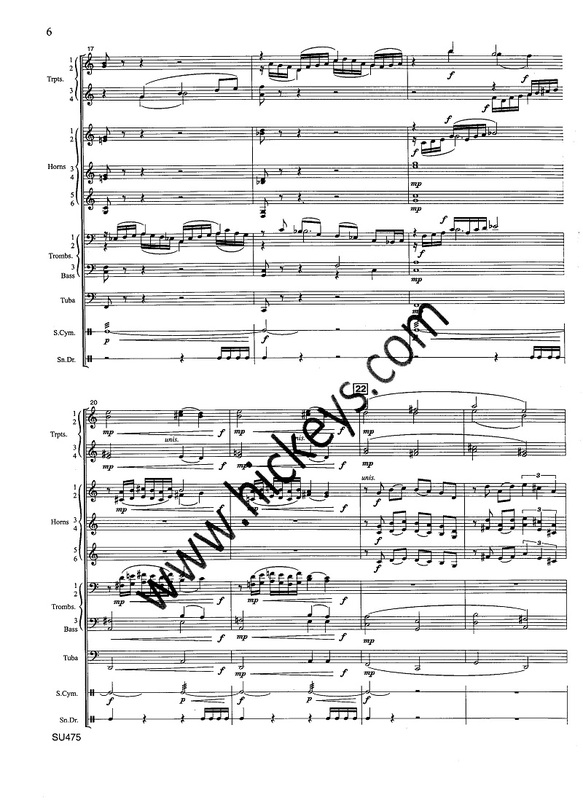 Performed by the hornists of the American Horn Quartet and the New York Philharmonic Orchestra. Includes TURNER Take 9 Antiphonal Fanfare; Farewell to the Red Castle; Barbara Allen; Ghosts of Dublin; EWAZEN Grand Canyon Suite; BERNSTEIN Overture to Candide; BRAHMS Hungarian Dance No 5; DESMOND Take Five; GERSWIN I Got Rhythm. 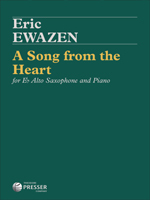 Includes EWAZEN Sonata for Tuba and Piano; V REYNOLDS Sonata for Tuba and Piano; CORWELL 2 AM; VELVET BROWN Te Dago Mi (tuba, euphonium, and piano); SILVERMAN Zigzags for Solo Tuba; GOMEZ Bonampak (tuba and piano); TOMASI Danse Sacree (tuba and piano). With Roberto Arosio, piano; and Neal Corwell, euphonium. 009414769329.
includes ECCLES Sonata; CASTEREDE Sonatine; EWAZEN Sonata (Concerto); FAURE Apres un Reve; Sicilienne; BRUCH Kol Nidrei; SCHUMANN Adagio & Allegro; KELLAWAY The Morning Song. Chris Gekker is Professor of Trumpet at the University of Maryland. As a soloist he has been featured at Carnegie Hall, Lincoln Center, and throughout the United States, Asia, and Europe. For 18 years Chris was a member of the American Brass Quintet. He was principal trumpet of the Orchestra of St. Luke's and frequently performed and recorded as principal of the Orpheus Chamber Orchestra. Includes EWAZEN Three Lyrics; Elegia; Elizabethan Songbook; Aftershock; A Hymn for the Lost and the Living; SNOW Winter; A Baker's Tale. With Ted Guerrant, piano, Rita Sloan, piano & Milt Stevens, trombone. John Holt, trumpet, with the Slovak Radio Symphony, Kirk Trevor, conductor. PAKHMUTOVA Concerto for Trumpet in Bb; EWAZEN Concerto for Trumpet and Strings; PLOG Concerto no.2 for Trumpet and Orchestra. John Holt, trumpet, with Natalia Bolshakova, piano. EWAZEN Sonata; TURRIN Two Portraits; WINTLE Northwest Miniatures; ELLIS Trumpet Piece; TULL Vignette; TRESTER Patricia's Aria; GERSHWIN Someone to Watch Over Me; KENNAN Sonata. With Martha Fischer, piano, and Katie Stevens, euphonium. 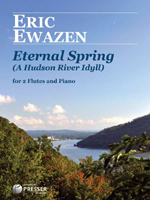 Includes BRIDGE Berceuse; RACHMANINOFF Elegie; Andante; GLAZUNOV Reverie; STRAUSS Nocturne; DEBUSSY Syrinx; CHOPIN Largo; EWAZEN Pastorale; DONIZETTI Una furtiva lagrima; BIZET Au fond du temple saint; KOETSIER Andante Sostenuto; STEVENS Elegy; SCHUMANN Mondnacht; TRADITIONAL Danny Boy. The University of Michigan Symphony Band with Fritz Kaenzig, tuba soloist. Contents: CHAMBERS Polka Nation; LAURIDSEN O Magnum Mysterium; EWAZEN Concerto for Tuba; COLGRASS Urban Requiem for Four Saxophones and Wind Orchestra; SHOSTAKOVICH Prelude in Eb minor; Folk Dances.